The geography of poverty dynamics is of core interest to both researchers and policy makers. Yet, due to lack of panel data, the measurement of such movements has been very limited. 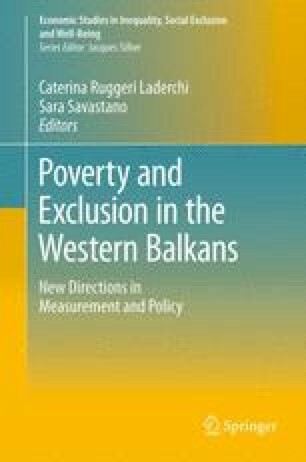 In this chapter, the authors consider a method to construct updated poverty maps between censuses. They build on the methodology used to construct counterfactual distribution of welfare measures. Unlike methods that rely on panel data or availability of time-invariant household characteristics, both of which are difficult to obtain, the authors propose a method that can be applied to most datasets. They use the example of Albania where census data were available in 2001 and household-level data were available for 2002, 2005, and 2008 to illustrate the updating of poverty maps. The results are quite encouraging to look at poverty mobility as they predict intercensal poverty estimates quite well. The findings, interpretations, and conclusions expressed in this chapter are those of the authors and do not necessarily reflect the views of the International Bank for Reconstruction and Development/the World Bank and its affiliated organizations or those of the Executive Directors of the World Bank or the governments they represent. The World Bank does not guarantee the accuracy of the data included in this work. The boundaries, colors, denominations, and other information shown on any map in this work do not imply any judgment on the part of the World Bank concerning the legal status of any territory or the endorsement or acceptance of such boundaries.